The grassroots pro-independence leader Jordi Sànchez was denied his freedom on Tuesday. The Spanish Supreme Court kept him in jail on the grounds that there are “new elements” of his involvement in the events investigated. The judge also argues that there is the risk of repeat offense because Sànchez “maintains his pro-independence ideology” and has not stepped down from public office. While the also-jailed deposed minister Joaquim Forn gave up his post as MP, Sànchez has not done the same. Yet, last week the same legal entity ruled to keep Forn in prison, despite his resignation. According to the judge of the Spanish Supreme Court, pro-independence civil society associations saw “citizen movement as a strategic element to achieve independence” from Spain. The judge used the notebook of the number two of the Catalan economy ministry, Josep María Jové, as evidence. According to him, it demonstrates that meetings between parties for a Catalan state and pro-independence associations, as well as that pro-independence grassroots leaders considered “citizen mobilization” to be “strategic”. Currently, there are four pro-independence leaders incarcerated in Madrid: the Catalan vice-president, Oriol Junqueras, the Catalan home affairs minister, Joaquim Forn, and two civic leaders Jordi Sànchez and Jordi Cuixart. Forn, Sànchez and Cuixart appeared before the Spanish Supreme Court on January 11. They were summoned after asking to be released. They gave up on a unilateral means to achieve independence in court, according to judicial sources. Sànchez has been in prison since October 16 for his role in Catalonia’s push for independence. 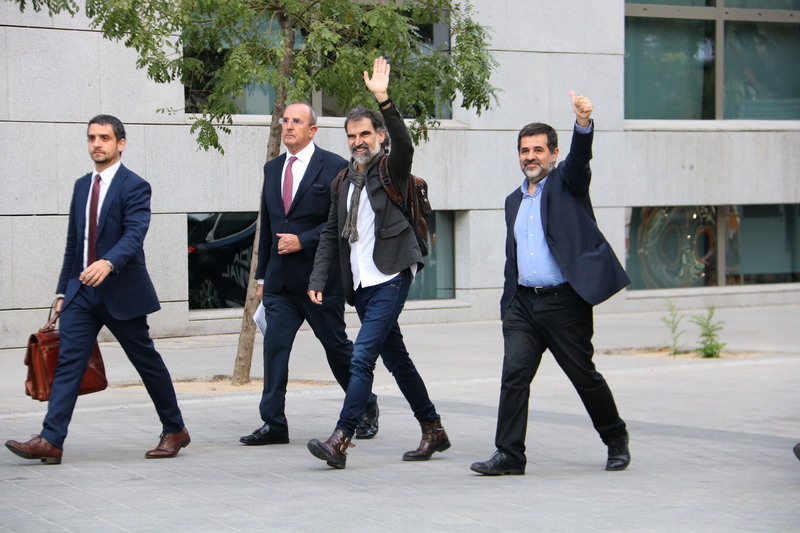 That day, the two leaders of the two pro-independence civic organizations, Catalan National Assembly (ANC) and Òmnium Cultural, Jordi Sànchez and Jordi Cuixart, arrived at the Soto del Real prison in Madrid around 11pm. Held without bail, they are under investigation for sedition, after being accused of “seditiously” mobilizing people on September 20 and 21 and asking citizens to protest in front of polling stations on October 1. Sànchez became one of the most prominent figures of the pro-independence movement, in his role as the president of the grassroots organization ANC. Once in prison, he resigned as president of the organization in order to run in the December 21 election for Puigdemont’s candidacy, Junts per Catalunya.